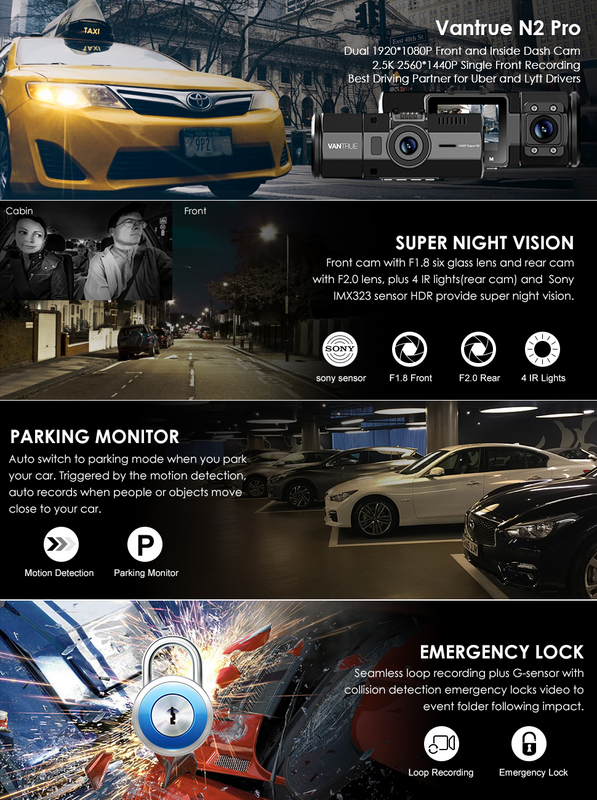 The FIRST 1440P + dual 1080P dash cam on the market. With a 170° front facing OV4689 sensor camera and 140° rear facing sony sensor camera(80° rotatable) in one body, N2 pro shots both front and inside the cabin simutaneously in full hd 1920x1080P 30fps, perfect dash cam for taxis, Uber, rideshare, lyft drivers, commuters, and families, provides drivers and passengers with optimum protection. If you don't need the inside recordings you can record with the single front facing camera, the advanced F1.8 front OV4689 lens ensures it to capture crystal-clear videos of the road front at: 2560x1440P/30fps, 2304x1296P/30fps, 1920x1080P/60fps, 1920x1080P/30fps. F1.8 6-glass lens front facing cam and unique HDR video system automatically balance the light and dark areas of the video, while Sony IMX323 sensor, F2.0 6-glass lens rear facing cam plus 4 IR LED lights greatly enhances night vision in car at low light environment. If you set it to AUTO ON/OFF, When low-light conditions are detected, the infrared LEDs will automatically turn on to support rear image recording, offering you and passengers a higher level of in-car safety. Built in microphone and speaker to capture high quality audio clear without distortion. Don't want to record voice? Just one press to turn the microphone off. Auto switch to Parking mode when you parked your car. Triggered by the motion detection, the dash cam will auto record once the front camera or inside camera detects motion. The camera needs a constant power supply either from an external battery pack or hardwire(Asin: B07G9WTWB9). Equipped with PC and ABS housing, the N2 pro dual dash cam can resist heat from -4 to 194 Deg, working temp is -4 to 158 Deg. Optional GPS for you to track the driving route, location and speed in either KM/H or MP/H. To use gps function, please buy an extra N2 PRO gps mount to use it(Asin: B07CYW6JXW). Auto Starts up and records automatically when the ignition sparks up, loop recording saves the latest the videos and overwrites the oldest videos when card reaches capacity. Supports up to 256GB card max, please format on the dash cam before use. 1, We recommend Samsung Pro Endurance Card or Samsung Evo Card. Samsung Micro SD cards would only be made in either Korea or the Philippians. Please be sure to buy a genuine Samsung card. 2, Please format sd card on your camera directly. Please insert the card into the camera, (if it says 'please insert TF card' here, please press the recording button(OK button) and press M button to access into the menu, go 'system setup' and choose 'format'. Then the card will work well on the camera. 3, Please press Power button to toggle the night vision mode ON, AUTO ON/OFF, OFF. 4,The built in 250mAh battery is just to keep setting, please always keep the dash cam plugged in, or it will keep telling you to connect the power. Lens	 Front: 170 degree wide viewing angle and full 6 layer glass lens with wide aperture of F/2.0. Rear: 140 degree wide viewing angle and full 6 layer glass lens with wide aperture of F/2.0. Note: the firmware file (in .bin format) could not be recognized by computer, it could just be recognized by the dash cam, so don’t try to open it on PC, just copy it to the card. 5. Once the dash cam upgraded successfully, it will turn on and work. 6. Please have a check the version of your device now (go to the System Setup menu and turn to the Version) and see if it is VTN2Pro8F.V21_IQ. If it is, then the camera has been upgraded successfully. 7. Format the microSD card when the update has been completed, or the camera will upgrade itself everytime when it detects the firmware file in the card. Fixed the bug of rear camera’s voice recording when loop recording is off. Any question, please contact us at support@vantrue.net. What is the latest firmware version for N2 Pro?